Troops of the Nigerian Army, in an operation with personnel of the Civilian- JTF, on Thursday, carried out an operation that led to the arrest of two key Boko Haram’s commanders, an army statement said. Those arrested are Ibrahim Jagwal, 38, who is an Ameer (commander), and the insurgents’ automobile repairman, Audu Ahmadu, 45. Going by Boko Haram’s ranking protocol, the two may have killed up to 50 persons or personally slit the throat of any of their parents, or family member to whom they are related by blood, to earn their “prestigious” rank as Ameers. 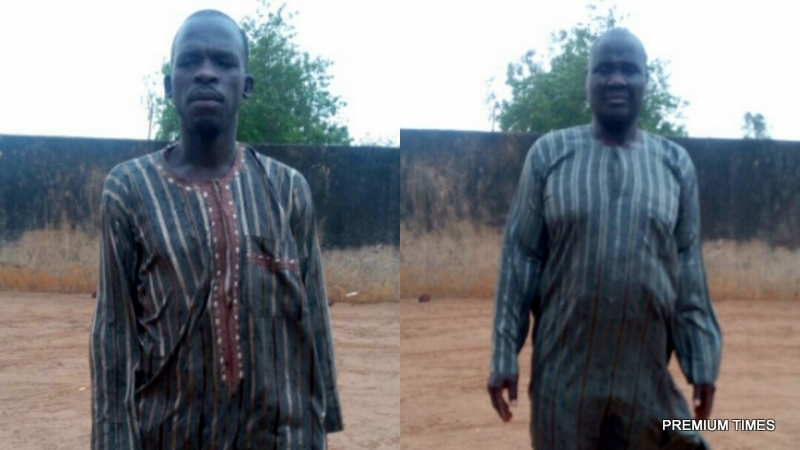 The arrest of the two Boko Haram leaders is being considered as a major achievement for the Nigerian troops and the ongoing counterinsurgency operations. Spokesman of the Nigerian Army, Sani Usman, a Colonel, said in a statement that the two men were helping the troops with vital information that could lead to further major arrests. Mr. Usman, who is the Acting Director, Army Public Relations, added 47 civilians comprising men, women and children had also been rescued during a raid operations in one of the Boko Haram’ camp between Borno and Yobe state. “Today, Thursday 17th June 2016, troops of Sector 5, 27 Task Force Brigade, 3 Division, in conjunction Civilian JTF from Maiduguri arrested a suspected Boko Haram terrorist, Ibrahim Jagwal, aged 38 at Gishiwa Dabua area of Potiskum, Yobe State. “The suspected terrorist who turned out to be the Ameer of the Boko Haram Terrorists at Tumbin Gini, Abadam Local Government Area of Borno State, also led the team to Garejin Audu in Potiskum, where another terror suspect, Audu Ahmadu, (alias Condemned) aged 45 years, was arrested same day. “Preliminary investigation confirms that Audu Ahmadu is a Boko Haram Engineer who specializes in repairs of automobiles for the Boko Haram terrorists group. It was further confirmed he was at the garage to repair 2 vehicles. The vehicles were recovered by the team, while the suspects have been taken into custody for onward movement to Joint Interrogation Centre. “In a related development, troops of 156 Task Force Battalion, 29 Task Force Brigade carried out clearance patrol yesterday. The patrol team came in contact with Boko Haram terrorists near Abalam, South West of Alagarno forest. The team engaged the terrorists who fled due superior fire power. “The troops pursued them and discovered that they left behind 7 men, 13 women and 27 children that were held hostage at Gemri village. The patrol team also recovered 4 Dane Guns, 3 Bows and 5 packs of arrows containing 114 arrows. “The terrorists camp was destroyed while the rescued persons have been moved to Maiduguri Internally Displaced Persons Camp”.